Looking for a twist on a classic? Try incorporating prosciutto di Parma into your seafood dishes. Look no further than our Octopus Saltimbocca recipe, created by our Specialist Chef Ryan Hardy of Charlie Bird Restaurant in New York City. 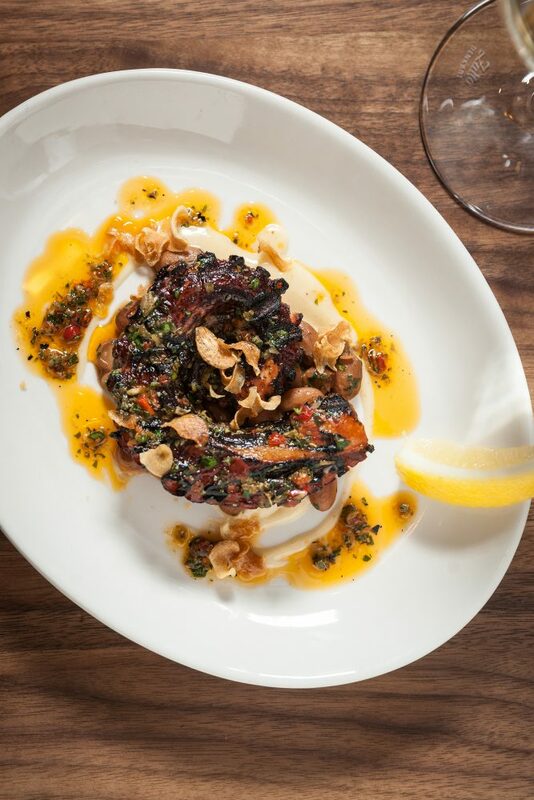 The butter lemon sauce beautifully compliments the crispy prosciutto and grilled octopus and veggies. This dish pairs well with a lively white wine or even a bold Italian red, and of course, is best served alongside crispy baguette for dipping into the flavor-packed sauce. Lay the prosciutto slices between two sheets of parchment paper on a baking sheet. Top with another baking sheet to weigh it down. Bake 15 to 20 minutes, just until the prosciutto is golden brown. Remove from oven; slices will crisp as they cool. Keep oven on at 350° Fahrenheit. Bring water and salt to a rapid boil in a large pot. Add octopus, cook until the tentacles are curled and dark purple, about 2 minutes. Remove from the pot; reserve 1/2 cup of the cooking liquid. Cool octopus slightly on cutting board. Slice the tentacles from the head. Remove the beak and discard. Add all the parts to a large roasting pan along with the carrot, fennel, fennel seed, peppercorns, chili flakes and bay leaf. Drizzle with 4 tablespoons of the olive oil; toss to coat. Cover with foil. Roast 45 minutes or until octopus is tender. Meanwhile, in a medium microwave-safe bowl combine chickpeas, 1 teaspoon of the lemon juice, parsley, 1/4 cup of the reserved octopus cooking liquid and remaining 2 tablespoons olive oil. Set aside. To make the sauce, place a large skillet over high heat. Add butter; let it sizzle and brown around the edges. Add julienned prosciutto; cook, stirring constantly, until starting to crisp. Add remaining 1/4 cup of the octopus cooking liquid and the sage, cook, stirring, until liquid is reduced by half. Stir in remaining lemon juice, to taste. To serve, warm the chickpea mixture in the microwave just until warm. Divide among four plates. Top with pieces of the roasted octopus. Spoon the sauce around the plate and top with prosciutto chips.